Larger projects demand commercial lumber sized beams, and we have them in stock or available from our suppliers, usually within a day. If your job requires wood beams, Nichols Lumber will be glad to help! 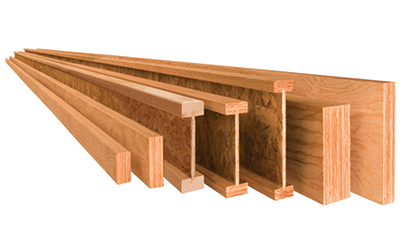 We stock most sizes of wood beams, in redwood, douglas fir, and some hardwoods. Large dimension wood beams for decks, patio covers, pergolas and more. Table of Beam Sizes Coming Soon! Ask our service pros to help you select the correct engineered lumber products and span dimensions to meet your load and weight specifications for laminated trusses, i-joists, and all construction framing. We can build engineered beams to your specifications. Our on-site band sawing and milling facilities offer you almost unlimited customization of beams and pre-cut framing lumber for your projects.